Our nuts are roasted and salted locally, they arrive warm to our shop where we immediately pack and ship direct to you! We want to ensure that the Brazils, pecans, almonds, filberts and cashews all arrive to you as fresh as possible. 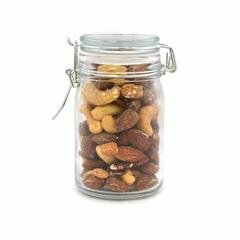 Our wire mason jars offers a fun, unique and whimsical way to display product. Each jar has a clear, shrink wrapped seal to keep in freshness and limit tampering. We use recycled material and soy ink whenever possible to offer our customers a sustainable, eco-friendly product. Naturally delicious mixture of cashews, almonds, brazil nuts, and pecans. Mason jars are a fun twist on displaying delicious snacks! Dunbar Sweet Potato Puree, 108 Ounce -- 6 per case.